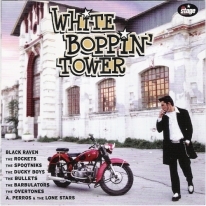 The "WHITE BOPPIN' TOWER" is a unique and collectable compilation that was released on the day of the first and now-legendary festival "White Boppin' Tower – 1st Rock'n'Roll Weekender" which held in Thessaloniki, Greece in mid November 2004! A mighty album, housed in a real cool artwork cover of the venue which took place the festival, that'll surely keep your memories alive until..."White Boppin' Tower II"!!! Last 10 copies on both formats!